Around 7:20 Sunday morning, a single-engine Japanese reconnaissance plane entered the cloud-streaked airspace over Pearl Harbor. Launched earlier that morning from the heavy cruiser Chikuma, the plane circled as the pilot studied the ground below. The attack on Pearl Harbor set in motion a series of battles in the Pacific between the Japanese and the United States. With the fall of Wake Island to the Japanese in late-December 1941, Midway became the westernmost US outpost in the central Pacific. Midway occupied an important place in Japanese military planning. According to plans made before Pearl Harbor, the Japanese fleet would attack and occupy Midway and the Aleutian Islands in Alaska as soon as their position in South Asia was stabilized. 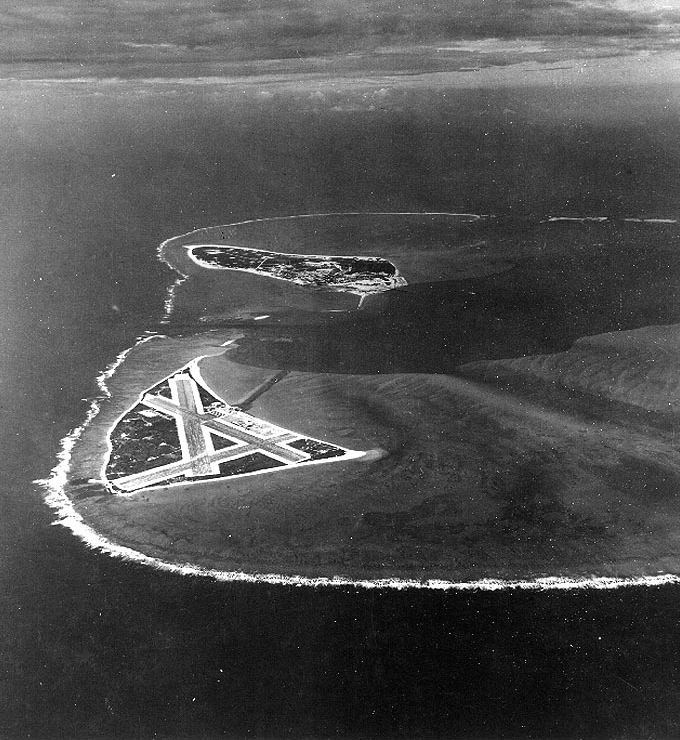 Defenses on the atoll were strengthened between December and April. Land-based bombers and fighters were stationed on Eastern Island. US Marines provided defensive artillery and infantry. Operating from the atoll’s lagoon, seaplanes patrolled toward the Japanese-held Marshall Islands and Wake, checking on enemy activities and guarding against further attacks on Hawaiʻi. The turning point in the Pacific came in June 1942, when the US surprised and overpowered the Japanese fleet in the Battle of Midway. The Japanese Combined Fleet depended on a complex system of codes to communicate by radio. The codes were regularly modified to avoid detection, but in the confusion of the rapid Japanese expansion in the South Pacific the change scheduled for early-1942 was delayed. The course to Midway started not on a map in a top secret chart room with top strategists and tacticians contemplating Japan’s next move, but was set by the deciphering of messages from the Japanese Fleet. This was done by a handful of US Navy intelligence officers stationed at Pearl Harbor. In the spring of 1942, it took cryptanalysts in Australia, Washington, DC and Hawai‘i to achieve the breakthrough that made an American victory at Midway possible. The Japanese naval code, known as JN 25, consisted of approximately 45,000 five-digit numbers, each number representing a word or a phrase. Breaking this code, which was modified regularly, meant finding the meanings of enough of these numbers that a whole message could be decrypted by extrapolating the missing parts. According to one of the leading codebreakers involved, it was like putting together a jigsaw puzzle with most of its pieces always missing. Leading the codebreaking effort was Station Hypo, the code name for the combat intelligence unit at Pearl Harbor under Commander Joseph Rochefort. Rochefort included members of the band from the battleship ‘California,’ damaged at Pearl Harbor. He thought their musical skills might make them adept codebreakers in much the same way that Marine bandsmen used to serve as fire control technicians on ship — the ability to quickly read and play music made them excellent mathematical problem solvers. By May 8, Rochefort knew that a major enemy operation, whose objective was sometimes called AF, was in the offing and that it would take place somewhere in the Central Pacific. When they checked this against their partially solved map grid, the found that “A” represented on coordinate of Midway’s potion and “F” represented the other. His superiors in Washington weren’t convinced; they devised a test that would flush out the location of AF. The radio station on Midway dispatched an uncoded message falsely reporting that the water distillation plant on the island had broken, causing a severe water shortage. Within 48 hours, a decrypted Japanese radio transmission was alerting commanders that AF was short of water. Several days later, he was sure the target was Midway. As a result, the Americans entered the battle with a very good picture of where, when and in what strength the Japanese would appear. On June 4, 1942, armed with information from Rochefort and his team, American planes caught the Japanese by surprise and won the decisive battle – it marked the turning point in the war in the Pacific. In the four-day sea and air battle, 292 aircraft, four Japanese aircraft carriers – Akagi, Kaga, Soryu and Hiryu, all part of the six carrier force in the attack on Pearl Harbor six months earlier – and a heavy cruiser were sunk. There were 2,500 Japanese casualties. The US lost the carrier Yorktown, the destroyer USS Hammann, 145 aircraft and suffered 307 casualties. The image shows Midway in November 1941. (The inspiration and information in this summary comes from NPS, NPR and Naval History) In addition, I have included other images and maps related to the Battle of Midway in a folder of like name in the Photos section on my Facebook and Google+ pages.